Please register with Statista by 30 November 2018. Alternatively, you can download the form and send it to FT1000@statista.com upon completion. You can find the English version of the form here (other languages are available under "Downloads"). Your revenue data needs to be verified. Please use one of the forms below for this purpose. The form must be signed in person by a Managing Director or a member of your Executive Committee (CEO or CFO). It must then be sent to Statista by email, fax, or mail. All necessary address details can be found on the form. Should you have any additional questions or would otherwise like to contact us, please email FT1000@statista.com. Enjoy and benefit from your company’s success! Revenue of at least 100,000 Euro1 generated in 2014. Revenue of at least 1.5 million Euro1 generated in 2017. 2 Eligible to participate are all companies from these countries: Austria, Belgium, Bulgaria, Croatia, Czech Republic, Denmark, Estonia, Finland, France, Germany, Greece, Hungary, Ireland, Italy, Latvia, Lithuania, Luxembourg, Malta, Monaco, Netherlands, Norway, Poland, Portugal, Romania, Slovakia, Slovenia, Spain, Sweden, Switzerland, United Kingdom. 3 FT and Statista will discuss if companies shall be excluded that are stock-listed and have experienced share price irregularities in the past 12 months. For example, companies may be excluded if their share price drops 25% over that period. 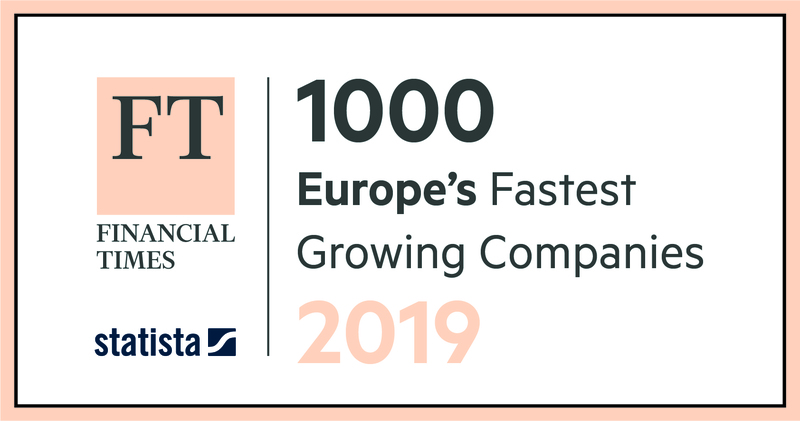 In April 2018 the second edition of the FT1000 - Europe's Fastest Growing Companies was published - with great success. If you're interested in taking part with your company in the next edition, please click the button below and we will make sure you receive an invitation with a personalised link. The application period will start in late September. New business opportunities: An inclusion in the list of the FT 1000 is a visible and public acknowledgement of your company’s performance that extends far beyond your specific industry and country. It will also generate attention for your business on the part of potential partners, customers, and investors around the world. Employer branding: Corporate growth usually generates demand for new employees. Being featured in the high-profile ranking of the FT 1000 will not only increase awareness of you as an employer, it also gives potential employees an understanding of your company’s future potential. Effective media coverage: The ranking will be covered in a special report, a supplement within a weekday edition of the FT newspaper and on FT.com. While the full ranking will be published online, FT reporters will focus on particularly interesting companies, sectors and trends in the articles of a special report that will appear in both print and on FT.com. Access to more than one million facts: All participants that provide us with data on their revenue will receive a free two-week Statista Corporate Test-Account as a thank you – irrespective of whether or not they are among the top 1,000 companies. 1 The use of the label and the word-and-image logo “FT 1000 - Europe's Fastest Growing Companies 2019“ for marketing purposes is subject to a one-off payment of a licence fee. Inclusion in the ranking, however, is completely free of charge.